Activists from People Against Prisons Aotearoa (PAPA) will lead a WWEA social justice forum on Wednesday 14th of November, in St Johns in the City, from 6.00 to 7.30 pm. 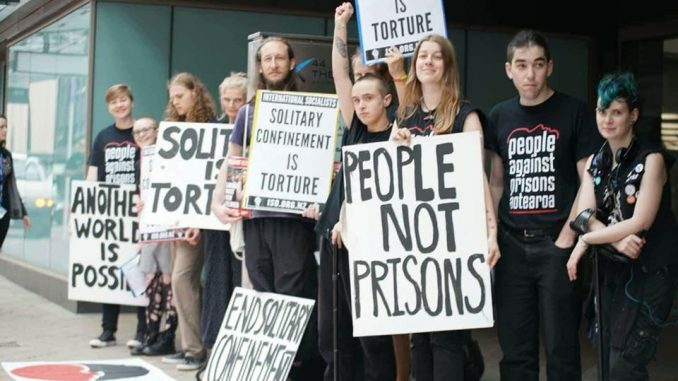 The forum will discuss PAPA’s list of material demands to put Aotearoa on the path towards prison abolition, including their campaign to end the brutal and dehumanising practise of solitary confinement. The session will include a short discussion on approaches to transformative justice: exploring practical methods of resolving conflict, supporting survivors, and helping people to change their harmful behaviour without going through the criminal injustice system. PAPA is an organisation of people seeking the abolition of the punitive justice and incarceration system. We want to replace it with a kinder approach that treats every person as indisposable. We want this, because our current system is one of cruel, archaic punishment instead of rehabilitative justice. It tears at the fabric of communities and perpetuates the crime it supposedly seeks to prevent. We work towards this goal with both short and long term praxis. We run a pen-pal network to connect those imprisoned with those sympathetic. We advocate on behalf of individual prisoners. We campaign against the most horrific practices of our system, like solitary confinement. We work to shift the way people view prisons, and develop policy around what Aotearoa without prisons would look like.